Omnibus Services is a West Australian proudly owned and operated family business, based in Canning Vale, WA. We specialise in Bus & Coach manufacturing, but not limited to. We have been moving people since 1956. Omnibus Services manufactures bus bodies for the Western Australian bus industry. They are known throughout WA as TOST (The Omnibus Services Trust). The TOST/ body are recognized for its strength, quality of workmanship and proven record spanning over 53 years in business and 43 years in manufacturing. The reputation TOST has built over these years comes through our recognizing the importance of accepting advice from customers in the early years of development and implementing their advice which gave us a unique understanding to build a bus body that suited the needs of the customer and suited the environment which the bus was to operate in over many years. When purchasing a TOST/Omnibus body you will have peace of mind that repairs, parts and warranty issues that may arise will be dealt with directly by the manufacturer here in Western Australia. TOST bodies are manufactured to suit all types of chassis including Volvo, Mercedes Benz, MAN, Scania, Iveco and Hino. Ranging from 35 to 59 seats. 4WD Bus Manufacturing in WA for Mining application, Tour operations and School Bus contracts are now available at Omnibus Services. Your local Western Australian Vehicle Body Builder servicing the transportation industry since 1977. Omnibus Services has expanded its manufacturing to include the “T” Series 4WD Bus using the same manufacturing design and expertise used in its Bus Manufacturing. Offering a coach styled passenger module which offers a spacious passenger area equipped with Bus type Heat / Cool Air-conditioning ensuring passenger comfort in all environments. The proven reliability, strength and local backup from a manufacturer operating in Western Australia since 1977, combine to offer peace of mind when purchasing an Omnibus “T” Series 4WD Bus. Omnibus Services offers the A to Z in accident repairs and spray painting for commercial vehicles and Buses at our Canning Vale facility located at 20 Coulson Way. Small or large jobs are catered for, from dent/scratch repairs right through to the worst accident repairs. Offering fleet colour spray painting, re-branding and everything in-between. Omnibus Services operates onsite a 25 metre paint booth for the largest spray painting jobs down to 2 x 4.5 metre paint booths and our 9metre paint booth. With 600sqm. preparation bay, Omnibus Services has the capacity to fit in any sized job or multiple of jobs at the same time without affecting lead-times. With our experienced team your vehicle will be in good hands, giving you peace of mind that the work being carried out on your vehicle will be to the highest standards. The paints Omnibus uses are Sikkens paint products which is a world leader in automotive paint systems and can match any colour to complete repairs on any vehicle. Omnibus Services is an authorised repairer for the major insurance companies and can carry out both insurance and private accident repairs. Omnibus Services has vast experience in modification work to buses new and old, from installing seat belted seats to additional luggage compartments through to Curved to Flat windscreen conversions Omnibus has you covered. The influx of imported buses has seen a rise in the need for modifications due to the lack of parts available for these types of buses, i.e. Flat Windscreen Conversions and components which are no longer supplied due to ever changing models. Given our experience in Bus Manufacturing our skilled workforce is well placed to offer the highest standard of work to ensure your modification or repair is completed to your satisfaction. For a friendly discussion on your requirements, whether it be a minor or major modification, call Omnibus Services for an appointment or if you prefer drop in to discuss your requirements. Go to “Contact Us” page for our location details and phone numbers. Omnibus Services not only manufactures and repairs buses. We also offer full Vehicle Body Building services from box trailers to Glass Truck Trays. • Chassis modifications & extensions. Alluvial Remote Camps, Site Project Group and Longreach Camps and these have been successfully let to a variety of users throughout the State. Caravans designed for onsite accommodation have also been designed and built with great success and again we are willing to custom design to your requirements. Using the latest innovations in van construction the Geostar product is easy to maintain and will provide trouble free service for many years. Omnibus Services is one of the oldest Bus Manufactures in Australia, beginning in the regional Great Southern Western Australian town of Kojonup. Born out of the requirement to supply buses into their own fleet, the Pryor Group led by Tom Pryor in 1977 began manufacturing School Buses. The beginnings of The Omnibus Services Trust known in WA as “TOST”, put their hand to manufacturing at a time nothing was available on the market which suited the needs of country WA. From this idea to supply their own growing fleet, the buses being manufactured were proving their worth in the poor conditions the buses were expected to operate day in day out with some buses never seeing the bitumen in their service life. Other bus operators whom were in the same position with few choices when purchasing their new School Buses approached TOST to have buses built for them. This was the beginning of what was to become over 40 years of manufacturing which led to diversifying into both manufacturing and repairs under the name “Omnibus Services”. Omnibus Services offers a proven track record, from TOST buses which are still operating in some capacity 25 to 30 years later. With the peace of mind when purchasing your new bus from Omnibus Services that you will be dealing with a third generation family operated company who has always been here and will be well into the future. The additional peace of mind given when purchasing an Omnibus Services Bus, is you are dealing directly with the company who manufactured your vehicle, the parts used to manufacture your bus are sourced locally and are readily available locally. This being more relevant now than ever, given the array of different models being imported by third parties with little control over parts and manufacturing. Cheaper in the short term not the long run. Think of Omnibus Services when sourcing a New Bus and support Australian Made. 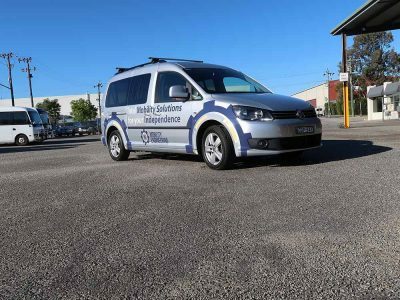 Accessible Transit Specialists/ Omnibus Services Perth have recently formed a business alliance with reputable disability access equipment supplier Mobility Engineering, Sydney. 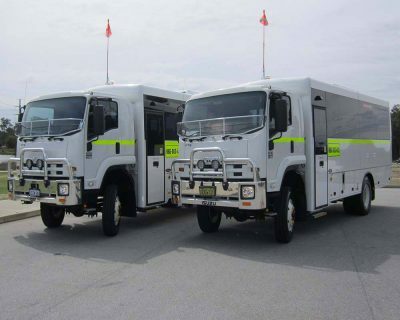 Omnibus Services recently delivered four Mining personnel transfer vehicles to a WA Gold Mine site where they will go into operation transferring workers from camp direct to site without the need of transferring into smaller 4x4 vehicles for the decent into the pit. 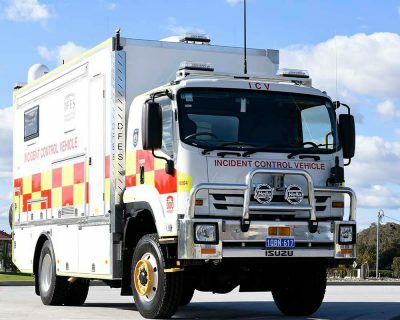 Omnibus Services completes the new Department of Fire and Emergency Services (DFES) 4x4 Incident Control Vehicle (ICV) for operations in the North West. 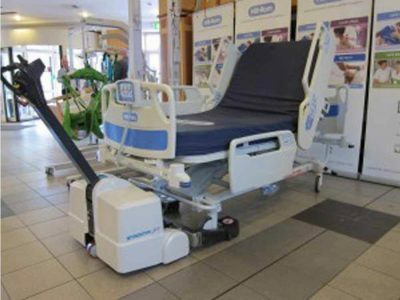 Introducing the latest in manual handling initiatives assisting the people who care for us care for them. The Stamina Bed Lifter takes the weight off hospital staff.